A woman with wisdom carries herself with a humble, quiet grace, yet her presence is powerful. I know what I bring to the table, so trust me when I say I'm not afraid to be alone. Girls compete with each other. Women empower one another. I am a woman..I am smart. I have opinions. I have feelings. I care. I make a difference. I matter. I Am A WOMAN and I proud of who I am. Women are strong and independent. Guys think we will break down when they leave, but it just makes us stronger and it kills them to see us move on. Women do cry, sometimes meek and submissive. 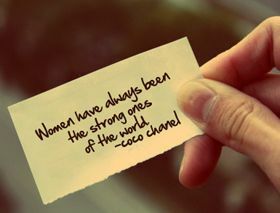 But once ignited or motivated; they are a lot stronger than men. A scorned woman wants revenge, a strong woman moves on. Areal strong minded woman can do any thing by herself, but a real wise man won't let her. No man succeeds without a good woman behind him, wife or mother. If he has both, he is blessed twice. It is sad to see women fight to have equal rights to men while their destinies are to be far more superior to them.